After December 17, there will be no way for new customers to purchase DLC for Ultimate Marvel Vs. Capcom 3. Capcom has announced that it will be discontinuing both Ultimate Marvel Vs. Capcom 3 and Marvel Vs. Capcom 2 from Microsoft and Sony's digital storefronts. Both games, as well as all of their respective DLC, will soon be unavailable for purchase. While physical copies will still be available in stores until stock runs out, as soon as the games are pulled from XBLA and PSN, there will be no legitimate means for new customers to obtain DLC for these games. On PSN, at least, Capcom is slashing 50% off all of the two games' respective DLC packs. Capcom asks us to "Stay tuned for details about any sales on XBLA". Capcom did not offer any explanation behind the takedown, which we will simply interpret as "Capcom being Capcom". The implications on tournament play are unclear, as two characters (Jill and Shuma) will be completely unavailable to new players. 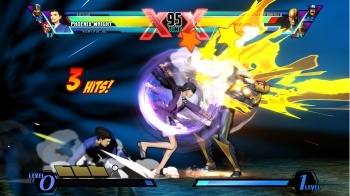 Ultimate Marvel Vs. Capcom 3 released just two years ago, on November 15, 2011.